If you're visiting Tokyo, chances are you're coming to Shibuya, the city's chaotic, neon-blazed youth district. Shibuya is best known for shopping and nightlife, so it can be difficult to find places to eat if you're seeking something better than chain restaurants or tourist traps. But this is Tokyo... there are plenty of excellent ramen shops hidden amongst the madness if you know where to look. After years of requests from ramen-hungry friends, here are the goods: The 10 best ramen shops in central Shibuya as of mid 2018. 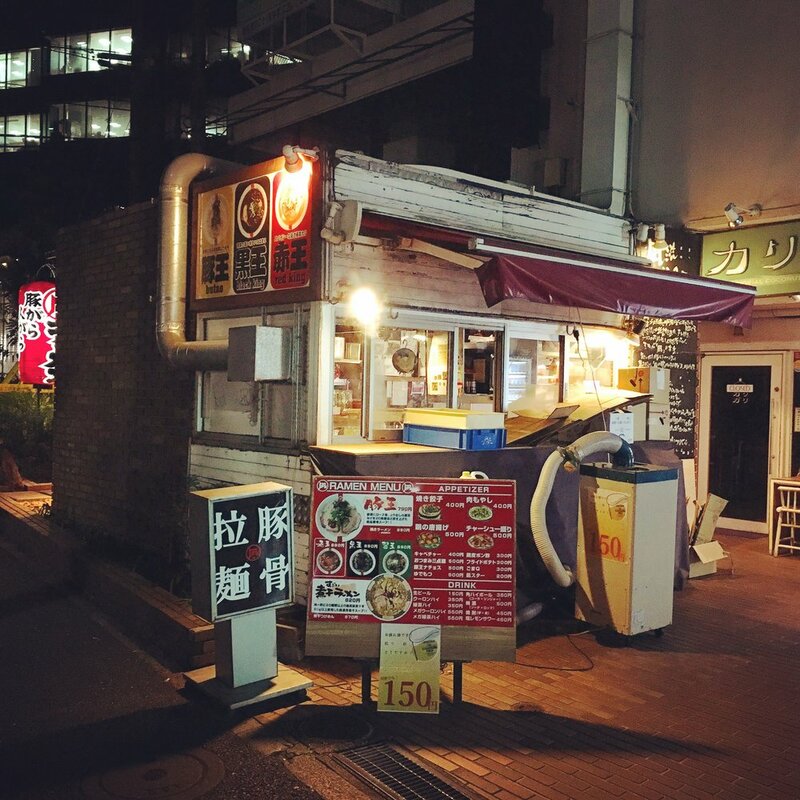 This list is based on Ramen Beast's experience of eating at over 1,500 shops within Tokyo alone. Hayashi has been considered one of the very best ramen shops within easy walking distance of Shibuya Station since its debut in 2003. The master, Hayashi-san, does all of the cooking himself, while his wife handles the customers. Only open for lunch, almost always a line. The soup is a silky double broth of tonkotsu and gyokai with a smooth shoyu tare. It's rich but drinkable. Noodles are supplied by the well known purveyor Mikawaya Seimen; solid ajitama and pork chashu toppings. A small slice of yuzu rind placed atop the bowl compliments the flavors perfectly. New school ramen executed at a high level. Located in the heart of Shibuya and open for over 60 years, this shop has remained somewhat of a relic amongst the bustling metropolis that has sprouted up all around it. Many of the regular customers have been coming here for decades and some of the staff appear to have been around even longer. Most likely you’ll get directed up the narrow staircase to a cramped second-floor seating area with small tables. Saddle up for some old school Tokyo-style shoyu ramen with chewy house-made noodles and dried onions, along with gyoza on the side. Order 'moyashi' if you want your bowl piled with bean sprouts. Wontonmen is available too. Nothing fake or touristy here, just old school Japanese soul food. A beloved and legendary shop. Nestled on a quiet backstreet just behind the Cerulean Tower, Kokū serves simple wontonmen in a light, clear soup with a choice of shoyu or shio tare. When you place your order at the ticket machine you choose whether you want three or five wontons in your bowl. There are a few rice dishes available on the side too. A laid-back, relaxing shop with an authentic vibe and bowls with a homemade feel. Located in Shinsen, Shibuya since its debut in 2007, Usagi (which means ‘rabbit’) is a simple ramen shop with solid following. Master Yamada-san offers a varied menu, with most soups using a triple broth blend of chicken, gyoka, and Japanese-style dashi. Shio ramen, shoyu ramen, tsukemen — the menu is varied and everything is pretty good. No MSG. One of the most popular items might even be the chili-oil-infused tantanmen. The noodles are special ordered from Itabashi Daiei Shokuhin. Rice bowl options available on the side. This shop is worthy of repeat visits for two reasons: it's conveniently located on Dogenzaka Street in the heart of Shibuya and it's open very late. Shinbusakiya serves high-quality Sapporo-style miso ramen. The soup is rich and creamy, but totally drinkable. The noodles are thin, curly and eggy, served slightly al dente. Spicy miso and tsukemen options are also on the menu, but we're partial to the standard miso ramen. Tasty chashu. Order your bowl 'tokusei' for all the toppings. There’s a ticket machine outside the shop with English for easy ordering. Toride’s master, Nakatsubo-san, was on the original staff that opened the legendary head shop of Ippudo in Fukuoka, where he trained for 13 years. Having learned the ramen trade at the shop that went on to become an international tonkotsu behemoth, he has since opened his own fine establishment in Shinsen-Shibuya. Aside from the classic Hakata-style tonkotsu that you would expect from an Ippudo disciple, there is a nice tsukemen on the menu and occasional seasonal and limited-edition offerings. The noodles are homemade; everything's served fresh and high-quality. Menya Nukaji debuted in Setagaya-ku in 2010, then closed and re-opened in central Shibuya in 2014. This shop serves standard introductory bowls of tonkotsu gyokai ramen and tsukemen. Rich, velvety soup with potent pork and fish elements. The smooth, straight, medium-width noodles come from Mikawaya Seimen. Pork belly chashu, egg, bamboo shoots and nori seaweed go on top. The recommended bowl is the Ajitama Tsukemen — dipping noodles plus an egg. The well respected Nagi ramen group has a plethora of shops both in Japan and overseas, with two in central Shibuya offering up different styles. Nagi Butao is a Hakata-style tonkotsu hotspot that gets the job done when you need that creamy pork fix. Nagi Niboshi serves what the Nagi brand is best known for: bitter, umami-rich niboshi soup, made with from dried Japanese sardines and balanced with shoyu. The noodles are housemade and come in various shapes and sizes. Butao is an easy pleaser for Tokyo newcomers; Niboshi is more of an acquired taste. Both are fairly solid. Sakurazaka, located in the Sakuragaokacho district of Shibuya, offers up tasty bowls of ramen and tsukemen made from a cloudy chicken-based soup combined with katsuo, additional gyokai (seafood ingredients) and pork, then topped with pork back fat and sliced negi. The noodles are specially ordered from a secret supplier. Both shoyu and shio are on the menu (we recommend the shoyu). Each standard bowl comes with half an egg, so order an extra is you're a big ajitamago fan. A popular shop, often busy during peak hours. The name Chibakara literally means ‘From Chiba’, and that’s exactly where the head shop of this restaurant is based (in Chiba's Ichihara City). The bowls here look Jiro-style at first glance — piled high with an excessive amount of bean sprouts and cabbage, along with chopped garlic and a hefty-looking slice of pork belly chashu. The master here even trained at Jiro and loves the genre. But whereas Jiro bowls come with a salty tonkotsu shoyu soup, the soup here is a creamy, decadent tonkotsu —100% pork all the way. The thick noodles here are supplied by Nakanishi Shokuhin, although at Chibakara's head branch they are handmade on site. This branch is run by the same company that runs Tomita at Tokyo's Narita Airport.